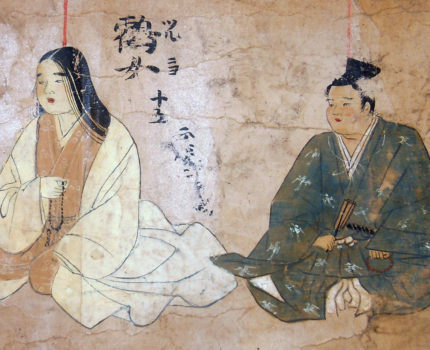 This lecture will explore the production and characteristics of portrait paintings made in pre-modern period Japan through a medieval period hand scroll entitled Ichiryu sôsho keizu (portrait scroll of a certain Buddhist school’s lineage). Ichiryu sôsho keizu scroll is a hand scroll containing portraits owned by and pertaining to the lineage history of Bukko-ji temple, which is a key Jôdo-shinshû temple in Kyoto. The scroll begins with details related to its production. In it, it states that the teachings of Shinran (1173-1262), who founded the Jôdo-shinshû School, continue to flourish despite sixty years after his death. It also notes that the figures depicted are of individuals who were alive at the time of the scroll’s production, and that the intent was to create a link for future followers to reaffirm their ties and commitment to the school. According to the inscribed date, it is clear that the scroll was produced in May 1325. The first set of portraits that appear after the text are of a couple who was the sect leaders, followed by around twenty men and women of all ages. The sitters were commoners and new portraits were added intermittently over the following periods until up to around the middle of the fourteenth century. Each of the painted individuals’ face is skillfully articulated using very fine brush work. In comparison, their costume, body representation and composition are extremely typological. Until recently, Ichiryu sôsho keizu was considered substandard to be recognized as portraits because of the stereotypical representation of people below the neck. However, accurately depicting the sitters’ face in delicate outlines while providing them with a standardised body is the very feature of a style of Japanese portraits called nise-e (likeness picture). It can be said that the Ichiryu sôsho keizu presents the essence of Japanese nise-e and their characteristic. Tetsuei Tsuda is the head of archives in the Department of Art Research at the Tokyo National Research Institute for Cultural Properties. After completing his post graduate work at Keio University, he joined Kanazawa Bunko Museum in Kanagawa prefecture as curator in 1991. In 1999, he was appointed as researcher at the Tokyo National Research Institute for Cultural Properties. He was awarded with a doctorate from Keio University after submitting his thesis on the study of Heian period esoteric Buddhist sculptural trends and characteristics. His particular field of interest is in Japanese Buddhist art (paintings and sculptures). His research is not limited to the study of art objects, but also expands into the fields of medieval Japanese religious studies and Japanese literature.